Visitors come from the countries, Ukraine, Germany, Canada, United Kingdom, Netherlands & Ireland. Topics: Texts, Audio, Projects, Forums, Faqs, and Contributions. archive.org Das Kabinett des Doktor Caligari ( The Cabinet of Dr. Caligari ..
On average 6.57 pages are viewed each, by the estimated 914,472 daily visitors. The programming language environment is PHP/5.3.10-1ubuntu3.2. There are 6 DNS records, such as ns3.archive.org, ord.sns-pb.isc.org, and ams.sns-pb.isc.org. 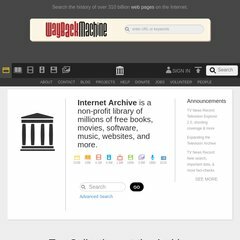 It is hosted by Internet Archive (California, Sheridan,) using nginx/1 web server. PING www. (207.241.224.2) 56(84) bytes of data. A time of 64.0 ms is recorded in a ping test, also its average full page load time is 1598 milliseconds. This is slower than 43% of measured websites.